Game Design and IFX students attend presentation by Larian Studio. 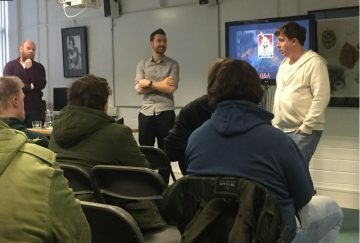 Representatives from Larian Studios, producers of the Divinity series of Role Playing Games (RPG), visited the college to give students some insight into the workings of their Dublin-based studio. Line Producer Chris Vossen, Writer Declan Dowling, and industry veteran Kieran Kelly highlighted in demand skills in the creation RPG Design, and announced upcoming internships in their Dublin studio.